LED (light emitting diode) technology was first developed in the early 1960s. For many years it was used primarily as indicator lighting in electronic devices. New technology allows us to use it for household lighting as well. Household LED lighting is growing in popularity due to the energy efficiency it provides to home owners. A household LED light can outlast a regular incandescent light bulb by more than 30 to 1. Not only are LED bulbs energy efficient, they are also non-toxic, and due to the extended life cycle, they reduce waste in landfills. LEDs are, by far, the most "green" way to light your home. The average operational life of the current LED lights is 100,000 hours, compared to about 5000 hours for a standard incandescent light bulb. While the LED bulbs are more expensive than incandescent ones, the long-term savings make up for the initial cost. Also, as LED lighting becomes more popular, it is expected that the initial cost of the bulbs will go down. The key strength of LED lighting is reduced power consumption. When designed properly, an LED circuit will approach 80% efficiency, which means 80% of the electrical energy is converted to light energy. The remaining 20% is lost as heat energy. Compare that with incandescent bulbs which operate at about 20% efficiency (80% of the electrical energy is lost as heat). In real money terms, if a 100 Watt incandescent bulb is used for 1 year, with an electrical cost of 10 cents/kilowatt hour, $88 will be spent on electricity costs. Of the $88 expense, $70 will have been used to heat the room, not light the room. If an 80% efficient LED system had been used, the electricity cost would be $23 per year - there would be a cost savings of $65 on electricity during the year. Realistically the cost savings would be higher as most incandescent light bulbs blow out within a year and require replacements whereas LED light bulbs can be used easily for a decade without burning out. LEDs are solid state lighting devices that utilize semiconductor material instead of a filament or neon gas. An LED light is a tiny chip encapsulated in an epoxy resin enclosure, which makes LEDs far sturdier than traditional incandescent light bulbs or fluorescent tubes. Since LEDs don&#39;t use fragile components such as glass and filaments, LEDs are able to withstand shock, vibration and extreme temperature. LED lights generate virtually no heat therefore they are cool to the touch and can be left on for hours without incident or consequence if touched. LEDs produce 3.4 btus/hour, compared to 85 for incandescent bulbs. In comparison, incandescent lighting expels 80% of the energy it consumes via heat, making the bulbs hot to the touch. LEDs reduce the potential for safety risks such as burns and fires. LED technology is continually advancing - producing brighter LED bulbs. The U.S. Department of Energy hopes to reduce the electricity used for lighting by 50% by converting to LED based light sources. LEDs are currently used for a wide variety of different applications such as: residential lighting, aerospace industry, architectural, automotive, broadcasting, electronic instrumentation, entertainment and gaming, the military, traffic and transportation. Since LEDs are focused lights they prove best at specific lighting tasks such as desk lamps, reading lights, night lights, security lights, spot lights, accent lights and lighting for signage. 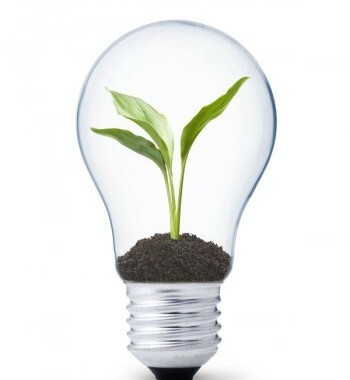 To learn more about how you can save energy in your home, please visit our Green Building page. Mountain Construction are North Carolina Builders that specialize in New Home Construction. 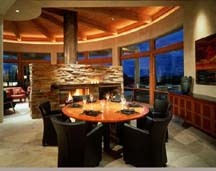 We also can provide Remodeling services, and are happy to work with you as Cabin Builders on your next cabin. Over the years, we have accomplished a great deal as Timber Frame Builders. Please contact us for more information. ← What is a Site Plan?